In collaboration with the Islamic Fashion and Design Council (IslamicFashionAndDesignCouncil.org) and inspired by the vibrancy of the Islamic fashion scene and in an effort to further expand the industry, Asia Islamic Fashion Week (AIFW2017) will be held at the Kuala Lumpur Convention Centre in Kuala Lumpur, Malaysia. AIFW is a uniquely designed trade event aimed at showcasing the blend of modest fashion with cutting-edge style that is within the Islamic context. Malaysia is set to play host to the inaugural event from March 30 to April 2, 2017. The retail industry will convene at the prestigious Kuala Lumpur Convention Centre over (4) four days to spot the latest trends in Islamic-inspired apparel, accessories, cosmetics and resources. With the theme ‘Establishing Asia as a Global Centre for Islamic Fashion’. 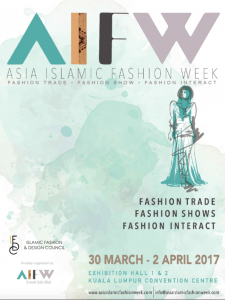 AIFW2017 aspires to be the most influential Islamic fashion & lifestyle marketplace in Asia by creating an avenue for the Islamic fashion business community to share their experience and knowledge. More than 10,000 visitors, 180 exhibitors, 100 designers, 100 international trade buyers, fashion influencers, business executives, fashion photographers and the entire media buzz from over 20 countries are expected to take part in AIFW2017. A platform for sustainable and profitable Islamic fashion and lifestyle business networks; covering the trade and the public. From luxury brands, to the latest trends in modest fashion, #AIFW 2017 brings you exhibitors from across the globe. Admission to view all shows is FREE. MUMU SCARVES, ASH & ANAS, PADUSI COUTURE, KHALIF BY ERMA FATIMA, GENERAL PRODUCTS BY AMY SEARCH, GAYA BY ADANIA, LA DIORA, NAFYANA BY LIANA GHAUS, CALACARA, V HIJRAH, DAANYA, RUMI, MARINAH YAZID, BLACK SWAN COUTURE (UAE), BARJIS (UK), CHENILLE (Uk) and AMJAAD (PARIS) and many more. The runway show is a must-see event! Local and international speakers, academicians and investors from various fields within the Islamic fashion & trade industry will take part in the first Islamic Fashion Conference and Fashion Pitching in Malaysia. Visitors will also enjoy various talks and workshops at the Fashion Interact segment.